The Man of Steel sequel may not be officially titled Batman vs. Superman, but that's certainly the tone of artwork director Zack Snyder commissioned for the charity We Can Be Heroes. 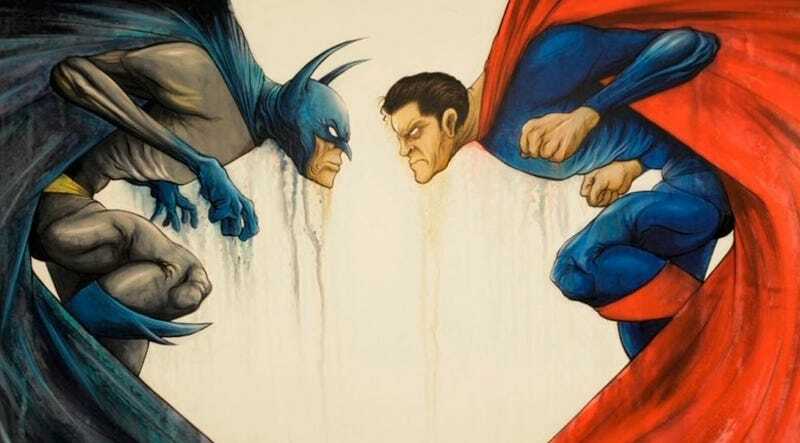 Snyder unveiled this trio of paintings during yesterday's Man of Steel live fan event, streamed by Yahoo! Movies. Below is a crop from "We Could Have Changed the World" by Jonathan Wayshak. Folks can bid on the paintings on eBay, and the proceeds will go to DC's We Can Be Heroes campaign to benefit three charitable organizations. Whether they're fighting or they become friends, or if they're friends and they fight, that's the fun of making movies and playing with this mythology. You get to take these icons and see how emotionally they fit together. I think that's the most important thing and fun thing. And, of course, there will be some physical conflicts as well. Lex Luthor came up briefly, but it was host Kevin Smith who brought it up Lex first, noting that Lex loves to refer to Superman as an alien. Snyder echoed, "Lex loves calling him an alien," with a smirk that has led some folks to call this a confirmation that Lex Luthor will appear in the sequel.